Juggling Frogs: Happy Birthday, Julie! 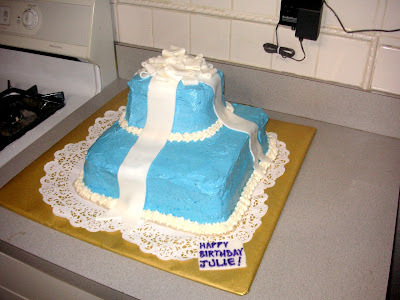 "Tiffany Box" cake for Miss Julie, our piano teacher (& friend), by request. That is a cool cake. Thank you, Jack! It's hard to tell from the picture, but this cake is HUGE. I think it had 60 servings! Happy, happy, happy birthday, Julie! I'm so glad you liked it.